Three of Pentacles show us persistence – clear priorities and commitments – your mind, heart and spirit moving in the same direction. You love your work, you are well informed and you can make great progress now. You have great skill, ability and talent – use them. Recognition is possible – your efforts will finally be rewarded. You are aware of the harmony that can result when you use your best skills in cooperation with other capable partners. You have the ability to create and work out practical plans for any project – advancing step by step because you recognize and value the role of each person in any endeavor. You ground your vision in the practical world through physical effort. Clarify your priorities and commitments – stick with the endeavors that you want to make stable, solid and tangible in your life. Support your creations with patience and tender loving care. Combine love with wisdom and hard work with play and with a proper nurturing attitude your creativity will pay off and you will reap the harvest. Hard work and dedication to your goal will result in mastery. Your best work combines both your spiritual understanding and your technical skills with energy and desire – it can raise you to higher levels. It should be rooted in the reality of the world and the needs of the community. Practical work, done consciously and with commitment can serve as a vehicle for self – development. Here are the fruits of your physical/material choices and the resulting growth. The resolution – expression and creation from the physical thesis/antithesis. Productive labor, healthy progress, craftsmanship, correct quality workmanship. Dedicated student/apprentice in a quality program with good guidance. A working, hands-on knowledge of things physical/material. The application/blending of mind with the physical. Practicality. How are you taking or expressing criticism of the work being done? Next to Sun or Wheel of Fortune: Have faith in your own talents – you are on the right path and should feel secure. Three swords in spread: There is loss possible in some negotiation – be prepared to make a change. Next to Emperor: You are experiencing a battle of wills – a clash of personalities in your working situation. In the first position: Your art – the output of your handiwork, the beauty that flows from the movement, the use of your body, the mystery you unlock from the inert materials of the world – is carried to such a high level as to bear witness to the hard reality of the spiritual realm, of the certain existence of God. In the second position: Your ability to extract a finished product from something entirely raw. Your art, your craft itself. “You” – once you turn on and apply yourself to a task. Independence, resourcefulness – the survivor’s instinct and talent to shape his environment to his support rather than his demise. In the third position: Healthy progress/growth presents itself. Produce now. You are awakening to the work that is your craft. Raise your will to the potential that will be released when you truly apply yourself. Now is the time for you to take charge of your affairs. The energy you invest will be rewarded. In the fourth position: Passion for an art/craft, even a material, i.e. a sculptor’s love for stone, a weaver’s love for cloth, the farmer’s love of the soil. This will most likely be your livelihood, but it may make do as your hobby. Relationships and activities will be subordinated to this love for your work. In the fifth position: You are planning now for growth in your Physical/material Plane – health, business, et al. Perhaps taking a much more personal interest in your business or personal affairs – how to imporve the quality/quantity. In the sixth position: Your feelings will center optimistically around physical/material progress. Your activities in work, diet, exercise, finances or such on your relationships, your personal life and/or creative endeavors will be very positive. In the seventh position: You will be tested in matters of business, health, et al. There is nothing to fear hear. These are challenges to bring you further toward your goal of being productive and efficient in what you do so that there is a healthy surplus. In the eighth position: You are immersed in increase in your Physical/material Plane – matters of work, diet, exercise, finances or such. You may take this as a status report that things are as they should be. You are doing your work, your exercise and things are going well. In the ninth position: While you may not be talking openly about your health, work or security, internally this is your concern. Your gut feels it and will push for mental accommodation. In the tenth position: Your safety net, the grace on which you can depend this next year involves resolution – healthy growth in your Physical/material plane. Hi I have drew the three of pentackes with the tower reversed? Thank you soooo much Diana!! 🙂 Have to add that I am so intrigued by the icons assigned to our person(s). I feel like they are mirror images of our selves, only in a different language. Very interesting! The cards in a reverse position basically mean “lessor than”, they are not “negative” cards … they just let you know you will not experience the “full impact” of the card, as you would if it were in an upright position. So, the information varies some in the reversed position. There are many readers who read the People cards as People – I, however do not … the cards refer to a specific type of “energy” that is present in your current situation – which can be your own or someone else’s – but it can also refer to energy in your personal life, jobs, friends, neighbors … etc. You may be missing your true message by trying to focus your thoughts on only one person. I can not “respond” to the cards in your layout since I cannot sense the energy in a written statement – sorry. Hi Diana! 🙂 I only do readings for myself, and habitually deal all my cards only using the upright position, are there any drawbacks to this? Or is it best to use the upright plus reverse position? Also, what do you think of this Celtic Cross layout when I asked “Why this person (Page of Cups) has stopped communication with me, and will he contact me again?”. 1.) Emporer 2.) High Preistess 3.) World 4.) Knight of Wands 5.) Ace of Cups 6.) Page of Cups 7.) Death 8.) Knight of Pentacles 9.) Lovers 10.) 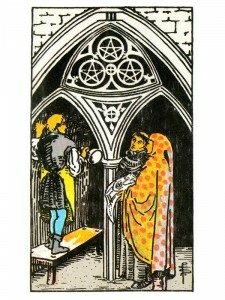 Three of Pentacles. I am having mixed thoughts on his feelings for me & what happened, and also on the outcome card. Does this mean he found someone else? I am glad you find the Tarot Divination’s helpful.